My little Harry has a serious infatuation with bread. He would eat it for breakfast, lunch and dinner every day if he was allowed! In fact recently when I was writing our menu and shopping list I asked the kids for their input and Harry’s response was “Mummy, I’ve told you what I like; bread, salt, cake, butter and enchiladas. Don’t keep asking me again, just make ALL the dinners from that!”. However, he does not like ‘yucky seedy bits’ or ‘pooey vegetables’ … so when I served this bread up he was highly unimpressed that I had sullied his precious bread with both seedy bits and vegetables!!! After quite a bit of encouragement he tried some … then scoffed the whole piece and promptly asked for another. Then he ate another piece with his dinner and gave me 100 out of 10 – I am claiming victory!!! 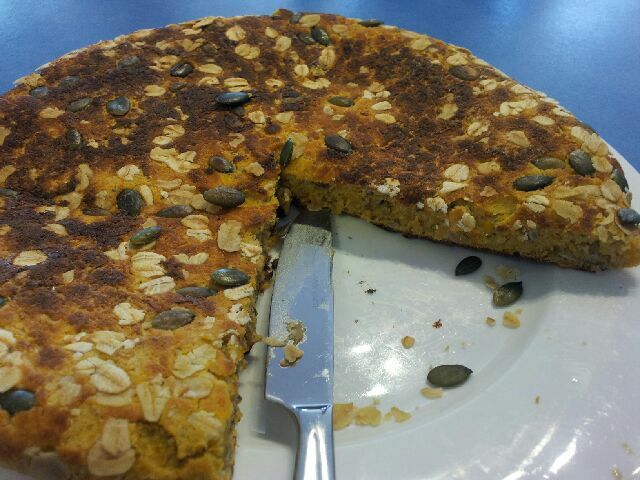 It is based on a pan bread from the ‘Multi-allergy cookbook’ by Lola Workman. See below the recipe for a conversion for Thermal Cookers. Stir in the mashed pumpkin and leave to sit for 10 minutes. Place your seeds into a processor and process until finely chopped. Add the flour, salt and seed mix to the pumpkin mix and fold together. Start with 3/4 of the flour and gradually add a bit more if the mix is too wet. Tip the dough on to the floured board and gently knead until the flour is absorbed. Shape to a rough ball. Pour the oil into you hands and rub it all over the ball of dough. 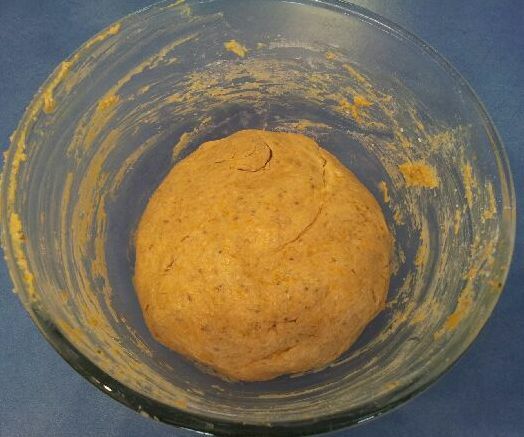 Place the dough back in to the mixing bowl, cover with a tea towel and leave in a warm place to rise for 20 minutes. 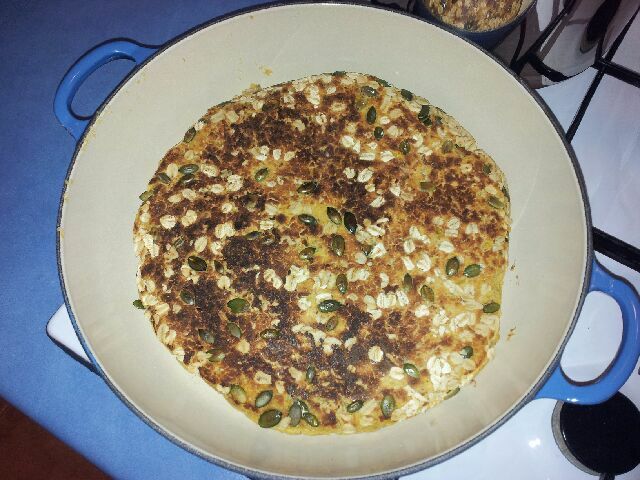 When the dough has risen, warm a heavy based pan on the stove, spray the base with some oil and sprinkle the oats and extra pepitas on the bottom. 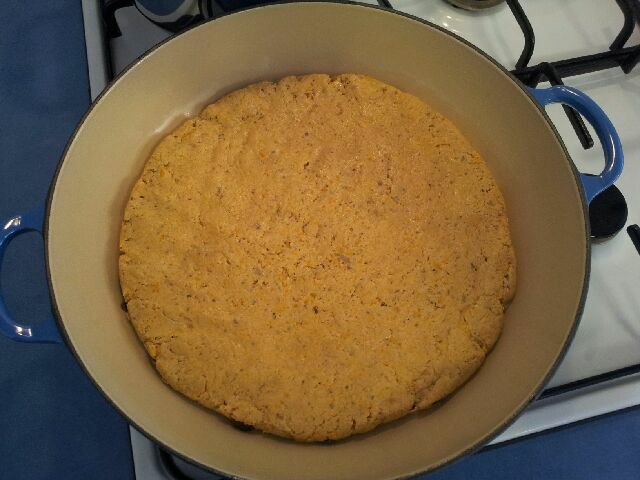 Tip the dough into the middle of the pan and, using your fingers, spread the dough to fill the pan. Cook for 3-4 minutes, then turn the bread and cook for a further 10 minutes until both sides are golden brown and sound hollow when tapped. Can be eaten warm or cold, on its own or with a spread. We cut it into wedges and it makes 12 wedges. Place your seeds into bowl and process on speed 6, 6 seconds. Set aside. Place 1/2 a cup of warm water into mixing bowl and add the sugar, gelatin and yeast. Speed 2, 5 seconds. Allow to sit. 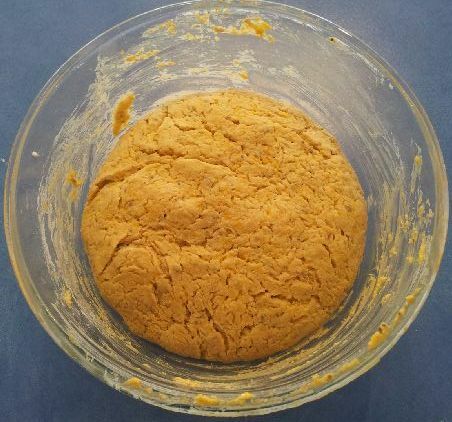 Stir in the mashed pumpkin (Speed 3, 15 seconds) and leave to sit for 10 minutes. 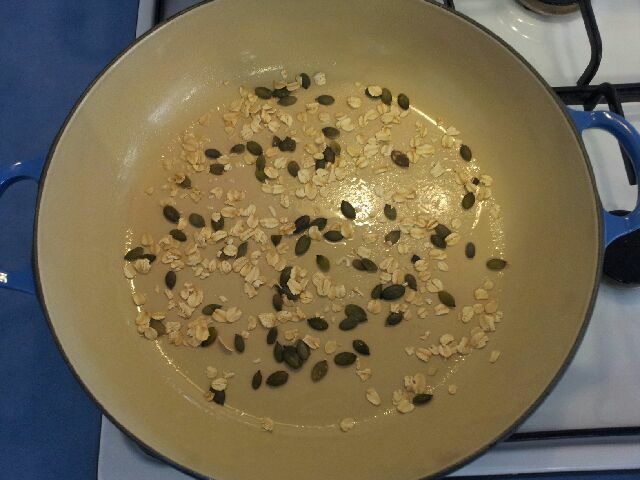 Add the flour, salt and seed mix to the pumpkin mix and mix on Speed 4 for 10 seconds. Start with 3/4 of the flour and gradually add a bit more if the mix is too wet. This looks excellent! Pan bread!